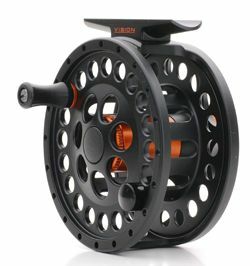 Kalu reels are real value for money. Their outlook is from our famous GT reel, just fattened up. They are machined die-cast reels which have eaten a sealed, smooth, drag system consisting of stainless steel and carbon discs. The one turn drag adjustment knob is fully machined. It can take more than enough backing with a suitable fly line. The biggest model can eat easily #10 Big Daddy fly line and 50 meters of 30lb backing, which makes it a proper tool for big pike hunters. Kalu is available in black, brunette and red.